I find that I need to add a LOT of water to get them to blend and spread. I was soaking up the excess water with paper towel and thinking it was a shame because lots of ink was being soaked up as well. Then I had an "AH-HA" moment. Instead of using paper towel, I placed a second piece of watercolour paper on top, pressed down, and then pulled the two apart. Ended up with two pieces of beautiful watercoloured background paper; the second one being a lot lighter in colour. Love how they turned out and ended up with twice the backgrounds I would have --- so I was HAPPY, HAPPY, HAPPY! :) Used the lighter one for the die-cut of the solid butterfly and the darker one for the background. I'm entering this card for the Time Out challenge (#19 - embossing with an optional twist of sparkle). My sentiment is heat embossed ... and the leafy sprig is very sparkley! :) Thanks Sandie! Thank you for the ideas with Brusho! I have to agree, the colors are absolutely gorgeous and two for one is brilliant! Love the colors you used on this one! Loll, such a beautiful card. Thanks for sharing that tip about putting the extra watercolour paper on top. The white works really well with this card. It's even more beautiful in real life! Thank you, Loll, for making such a gorgeous birthday card for me! Wow...AMAZING colors...such a stunning card! Gorgeous card, Loll! I love the background you created and that beautiful butterfly! Loll this is just so amazing the colours are stunning and the delicate butterfly so beautiful, this would be great to Time Out!! That was a great aha moment! Love that you can get 2 for 1! A perfect card for Susan! Oooooh, I LOVE this card, Loll! 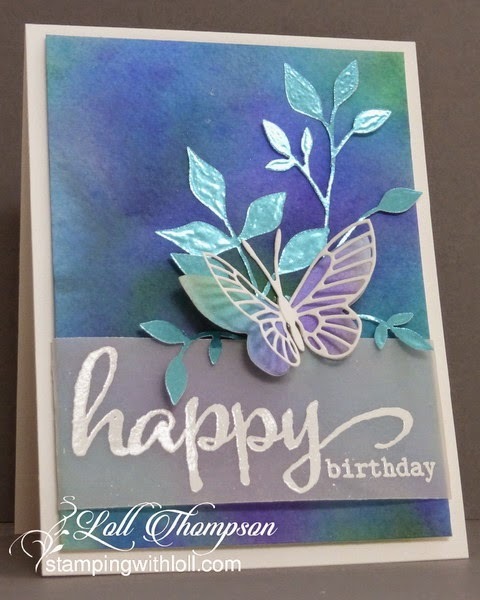 The color combo is so lovely and the I love the look of the shiny leaf sprig and the butterfly. Great idea about pressing the 2 pieces of paper together - Bonus! I'm not familiar with Brushos, but after seeing your GORGEOUS card, I want them! This is such a stunning card, Loll! The colors you created on your background are so beautiful, and I love the vellum butterfly and leafy branch! Thanks so much for the tip on soaking up the excess...Brilliant idea! I am certain that your friend is going to cherish this stunning work of art!!! Beautiful card! Thank you for joining us at the Time Out Challenge.